You can't beat fun at the ol' ballpark. My dad used to say that. So did a lot of other dad's, broadcasters, ballplayers and fans all over the country when they would talk about their love of baseball. The older I get, the closer I get drawn to the game of baseball. This season is no different. I can't wait for Opening Day! between the Brewers and Cardinals? This winter was especially hard to deal with in the aftermath of September 11th. I need baseball to help keep my mind off of the terrible things that are going on in the world around us. It might sound trivial, but having a ballgame on the TV while I am working on the computer or editing film is the best background music I could ever have. 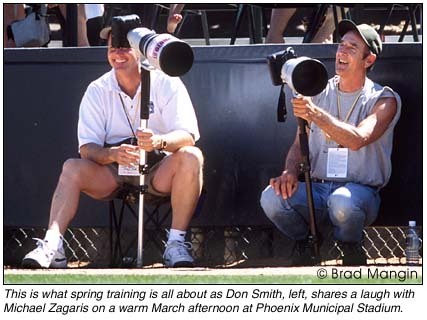 My first assignment in 1991 was to drive over 200 miles west of Scottsdale to shoot the Padres and Angels in Yuma, AZ, spring training home of the Padres back then. My picture editor insisted that I make the drive that day early enough to also shoot the "B" game at 10am because the Padres were breaking out their new uniforms (they had finally ditched the brown and orange by switching to blue and orange). Back then most teams still wore their regular season uniforms in the spring. Remember that? You could actually make pictures that looked real instead of some of the crap you get now when the Padres play the Mariners and they are BOTH wearing blue tops. Recently it has become more and more difficult to get an assignment to cover spring training (unless you live locally) because of all the cost cutting in most businesses that use photography. Everyone from the card businesses to the editorial businesses have fallen on hard times and are relying more and more on wire pictures, old file stuff from last year and Allsport (Getty Images) to meet their needs. A tip of the cap here to companies like Fleer who still send their top shooters like Don Smith (one of the hardest working shooters in the business) to spring training for 35 days! Last season I never made it down to Arizona and was really eager to get the chance to return this year. Luckily, my baseball photo editor at Sports Illustrated, Nate Gordon, gave me the last-minute assignment in early March to head down to the Cactus League for a week to help out V.J. Lovero shoot some players they needed for the scouting reports in the baseball preview issue. I arrived at Maryvale Baseball Park (spring home of the Milwaukee Brewers) on Sunday morning, March 10 after getting only two hours of sleep. I caught a cab for the Oakland Airport at 3:45am and got on a plane at 6:10am for Phoenix. I wasn't tired at all. I was so excited to be there. I could sleep when I got home a week later. There is no better game than baseball. When I head out to the park I get so wrapped up in the game and the atmosphere that I clear my mind of all the crazy things that are going on in this business: clients demanding buyouts; leagues trying to grab all rights to our pictures and the prospects of a labor stoppage, etc. It just doesn't matter once I get to the yard. Let me shoot some ball. 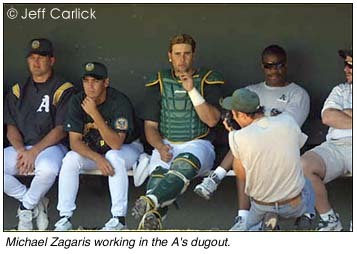 * You know you are at Phoenix Municipal Stadium when you see Oakland A's team photographer Michael Zagaris in the A's dugout DURING the game shooting candids of Ramon Hernandez with his wide-angle lens. Ya gotta love the Z-Man! 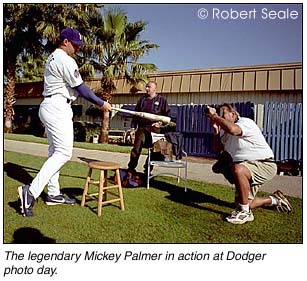 * You know you are in spring training when the legendary Mickey Palmer from Topps is shooting Dodger outfielders in Vero Beach while standing in the outfield himself after convincing a Dodger coach that he needed to be out there to make better pictures. * Speaking of Vero Beach, it doesn't get any better than going to Dodgertown and getting the chance to hang out with team photographer Jon SooHoo. 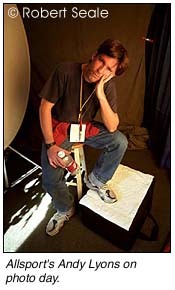 Jon has such a great attitude and he is always so helpful to other photographers. Why wouldn't he be? 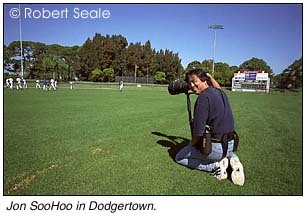 SooHoo was Randy Johnson's chief photographer for the college newspaper at USC! * It's good to see that the A's still have the Hooters girls serving up the media lunch down the rightfield line at Phoenix Muni. The lunch isn't free anymore and the food isn't that good, but it's still a great tradition and one that Jeff Carlick never misses when he is in town! * Rich Pilling of Major League Baseball needed to have a refrigerator fully stocked with Fat Tire Beer in his Scottsdale hotel room after getting drilled in the chest with a BP homerun ball while walking in the parking lot behind the outfield fence at the Braves facility at Disney in Lake Buena Vista, FLA. His black and blue bruise has just gone away. * You gotta love the press room at Dodgertown, where Tommy Lasorda yelled across the room to Jon SooHoo, "Tell that guy to get his hat off!" as Robert Seale from The Sporting News was eating his lunch while wearing his trademark Houston Colt 45's hat. Like Billy Bob Thornton, Seale is rarely seen without the 1960's-vintage ballcap on his head. * No one else has more fun in Scottsdale than Eric Risberg (The Count) from the AP. Eric gets the most out of his days during his three-week stay at the Hampton Inn in Old Town Scottsdale. A typical day for Risberg starts with golf at 7am. He follows that by having a nice breakfast. 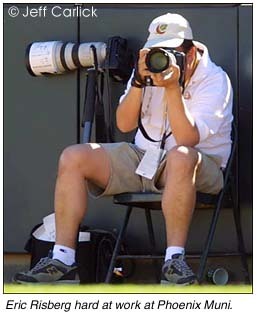 He then heads to a local ballpark (they are all so close together in the Cactus League) to cover a 1pm game. After putting a few really nice pictures on the wire he relaxes by knocking back a few nice cocktails before dinner. Then he has a VERY nice dinner at one of the area's finer restaurants, capped off with a very special cigar. Risberg does this EVERY day for three weeks! Not really, it just seems that way when Rich Pilling or Kevork Djansezian is in town! * The best sound of the spring was the pop that V.J. Lovero's fastball made while hitting my glove during a game of catch we had one Friday afternoon. Lovero was covering his first full spring training in three years and was having a great time as he was tinkering with his motion and experimenting with a new side-arm delivery. Lovero was having a hard time finding his release point, but had a lot of movement on his heavy sinker. There was so much movement on the last pitch I caught from Lovero and it was so heavy that it popped my glove very hard, causing me to throw the glove off my hand while screaming. The game was called, but Lovero couldn't have been happier while showing off my black and blue hand to everyone at dinner that night. Lovero still has his good stuff. * Don't ever forget your travel humidor full of cigars in your hotel room when you leave town. I mistakenly left my Dunhill travel humidor (that I purchased from The Count) on the TV in my hotel room when I checked out and flew home to the Bay Area. I didn't realize it was missing for a few days and called the front desk. They checked with housekeeping and found it. I had them FedEx the humidor back home to me and there were two cigars missing! The Count says that's not too bad and I should consider the missing cigars a finder's fee. * You can't beat an evening at Don & Charlie's in Scottsdale. This place is crammed with baseball memorabilia and baseball people. The food is pretty decent, the cocktails are always good and you can't beat it when owner Don Carson springs for free desserts for the entire table! If you ever make it down to Arizona for spring training or any other reason you got stop by. During our visit Michael Zagaris wanted calmer but he didn't want it deep fried. They sautéed the calamari for the Z-Man and it was a big hit. They might even have it on the menu named after Z by the time you get there! year. I hope there is no labor stoppage next year, but I am not gonna worry because there is nothing I can do about it. All I know is that Opening Day is Sunday night in Anaheim and I will be there. Here's to a great season in 2002 and here's to third base coaches everywhere sending the runners home from third with less than two outs so we can get some home plate action!